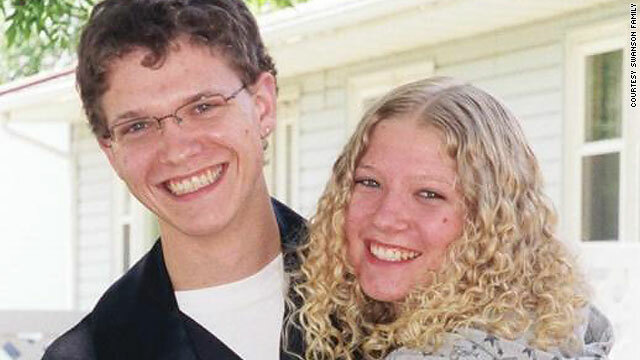 Minnesota college freshman Brandon Swanson, shown with his sister, Jamine, disappeared in May 2008. New York (CNN) -- It was the last day of classes, and Brandon Swanson, a 19-year-old freshman at Minnesota West Community and Technical College, was celebrating with his friends. Swanson called home shortly after midnight May 14, 2008, telling his parents he needed a ride because he had driven into a ditch in the neighboring town of Lynd, Minnesota. Annette and Brian Swanson immediately set out in their pickup to look for their son and his green Chevy Lumina sedan. "We got in the pickup to go to this spot where he felt he was," Brian Swanson recalled. He thought he knew exactly where his son was, about 10 minutes from their home in Marshall. "He was absolutely positive he knew where he was," Brian Swanson said. The parents stayed on the phone, talking to their son as they headed to pick him up. But when they arrived, there was no car and no Brandon. They turned around and flashed the lights on their truck. "We were saying, 'We're flashing our lights!' " Annette Swanson said. Over the phone, they could hear their son working the light switch in his car. Click-click, click-click. "Don't you see me?" he asked. "There was nothing," his father said, "absolutely nothing." "At one point, he hung up on me, so I called him back and apologized," his mother said. Swanson told his parents he would walk back to his friend's house in Lynd. His father drove home to drop Annette off and then headed back to look for the teen. They exchanged calls just before 2 a.m. and eventually carried on a long conversation while the younger Swanson was walking, trying to direct his father to where he was. He told his father to look for him at a nightclub parking lot that was a popular meeting spot in Lynd. But at the 47-minute mark, the call ended abruptly. The teen shouted an expletive, and the phone went dead. We called at least five or six more times. He never picked up the phone again. It was the last time anyone heard from him. "We called at least five or six more times," his father said. "He never picked up the phone again." The Swansons turned to their son's friends for help. They searched all night, driving down dirt roads and through farmland. There was no sign of him. At 6:30 a.m., Annette Swanson called the Lynd Police Department to report Brandon missing, and officers eventually joined the search. They, too, came up with nothing, and a countywide request was dispatched to expand the search. The response was delayed because, officers pointed out, it was not that unusual for a 19-year-old to stay out all night after finishing college classes, Annette Swanson said. One remark stayed with her: An officer said that at his age, her son "had a right to be missing." Phone records later showed that the teen was nowhere near Lynd, where he told his parents he was. His cell phone calls were traced to a tower 20 miles away in Minnesota. That afternoon, Lyon County police found Swanson's vehicle in Porter, approximately 25 miles from Lynd. "It was off the side of a field approach, and the vehicle was hung up," Lincoln County Sheriff Jack Vizecky said. "It's sort of a sharp incline, nothing major but enough that the car would get hung up so the wheels are too high off the ground to get any traction." Nothing else unusual was found at the site, and officers could not determine which direction the teen had headed after he left the vehicle. "There's grass in the ditch and gravel on the road, so it's possible to leave that vehicle and not leave any tracks," Vizecky said. Investigators brought in search dogs, and they led investigators to woods by the bank of the Yellow Medicine River. The river's depth ranges from knee high in certain areas to 15 feet in others. At the time Swanson went missing, it was flowing high and fast. "There are two miles of the river in that area, and it took six hours to walk it," Vizecky said. He said he personally walked the river every day for 30 days. "At the time, the dogs indicated, and it was believed, that he must have fallen in the river in that area," he added. "So we searched that area, on the premise that he'd be washed downstream." But investigators are not convinced that the teen fell into the river. Vizecky said Swanson should have been found in the river or downstream, had he fallen in. Annette Swanson said she is not convinced her son drowned, either. "There really is nothing to indicate that he's in the river," she said. According to her, one bloodhound followed a scent from the stranded car down a gravel road to an abandoned farm. "It was a long trail ... about three miles," she added. The new trail path also led to the Yellow Medicine River. "The dog actually jumped in the river, jumped back out, worked the trail up to another gravel road and then lost the scent," she said. Vizecky leaves open the possibility of foul play. "The only thing would have been if someone was in the shadows, and they got him that way," he said. "I can't say there wasn't someone else there, but I can't find any evidence of it." Cadaver dogs and searchers, he explained, should have found a body or some evidence if Swanson had succumbed to the elements. "I can't explain why clothing, belongings wouldn't surface," Vizecky said. "I can't explain why after searching for three weeks, [the dogs] could not smell anything." The Swansons want to know what happened to their son. "You know people don't vanish into thin air, but it sure seems like he did," Annette Swanson said. The couple is responsible for the enactment of Brandon's Law, which became effective in Minnesota on July 1, 2009. The law requires authorities to conduct a preliminary investigation without delay when a missing persons report is received. Anyone with information that could lead to the whereabouts of Brandon Swanson is asked to call the Lincoln County sheriff at (507) 694-1664.